Mother's Day Gift ideas - the perfect gift for every mom! Mother’s Day is fast approaching and I always seem to leave my shopping to the last minute. However, this year I have planned ahead and have already taken care of things for my own sweet mom. As she is my biggest fan, and avid reader of this blog, I simply can not share what I did for her. I thought I would help you all out and round up some of my favorite things in my Mother’s Day Gift Ideas, to give to your mom, or any special lady in your life. In my opinion, Mother’s Day is the perfect time to gift something that is super indulgent and that you would never, ever purchase for yourself. A special treat, so to speak. That being said, indulgent doesn’t have to be expensive. Get her that gourmet coffee she likes, or the super fancy hand cream (the best one ever, in my opinion), or her favorite, special chocolate. These are small luxuries that are meaningful, but don’t have to break the bank. If you are shopping for a beauty lover, get her a gift set of her favorite fragrance, so she can pamper herself, or a travel set so she can take them with her anywhere. This palette is universally flattering and contains gorgeous neutral for your entire face. It is one of my favorite palettes. Personally, I have always adored Diptyque candles, but would never be able to justify the $65.00 price tag for one single candle. This set is the epitome of a special treat for me. You get 3 minis for $100.00 and get to spread the love to several different areas of your home. Another way to go, is to indulge and get her that pricey item she has been pining after for so long, or surprise her with something super special, like this necklace. I received this myself as a birthday gift last year and it has my 2 son’s and my husband’s initials woven into a super delicate gold chain. I treasure it and almost never take it off. A couple of things I have been wanting forever, but seem too frivolous and expensive to even consider are this clutch and this curling iron. I would never buy either of them for myself, but would love them as a gift. Another great idea is a themed gift. 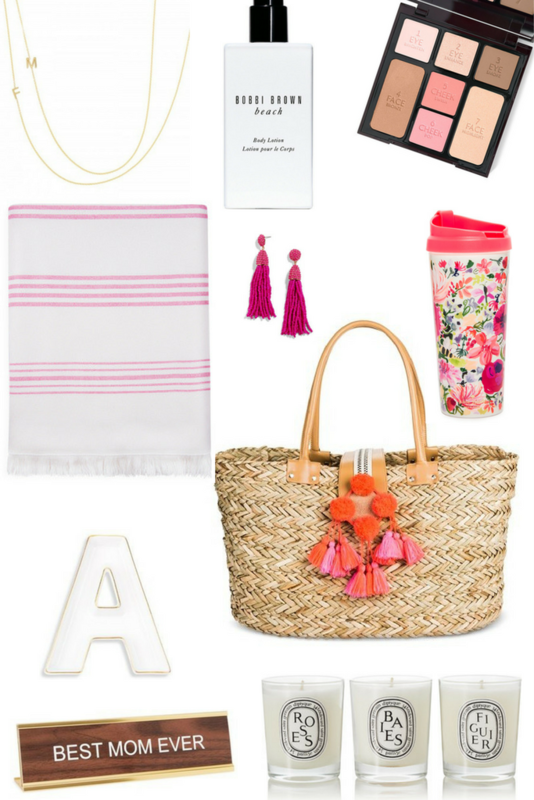 For example, if your mom loves the beach, why not fill this fun tote, (this one is cute, too) with a beautiful Turkish towel ( they are lightweight, dry fast and can double as a sarong or blanket) this lotion, which smells just like the beach, and one of my favorite coffee table books ever that goes perfectly with this theme. If your mom has a sweet tooth and/or likes to cook, why not wrap up this adorable apron with a cook book or baking book? See what I am doing here? Think about what your mom loves and create a themed gift around it. Not only is it thoughtful, but also creative and different. You could also serve her breakfast in bed and gift her this cute romper or these super cozy pajamas. If you are waiting until the last minute, fear not. There are always gift cards for spa treatments, manicures, her favorite store and so on, but I do always like to pair them with a little something to wrap up and gift. Some examples include these fun and super on-trend earrings, this initial dish, adorable coffee travel mug and candy bento box. Of course, there is always this cute sign, if you want to spell it out for her. I hope this Mother’s Day Gift guide was helpful. Personally, I will be doing hair and makeup for my older son’s production of Grease that weekend, but I am hoping for a long snooze in the morning and for my guys to “surprise” me with breakfast in bed, like they do every year. Sending love and light to all of the moms out there!